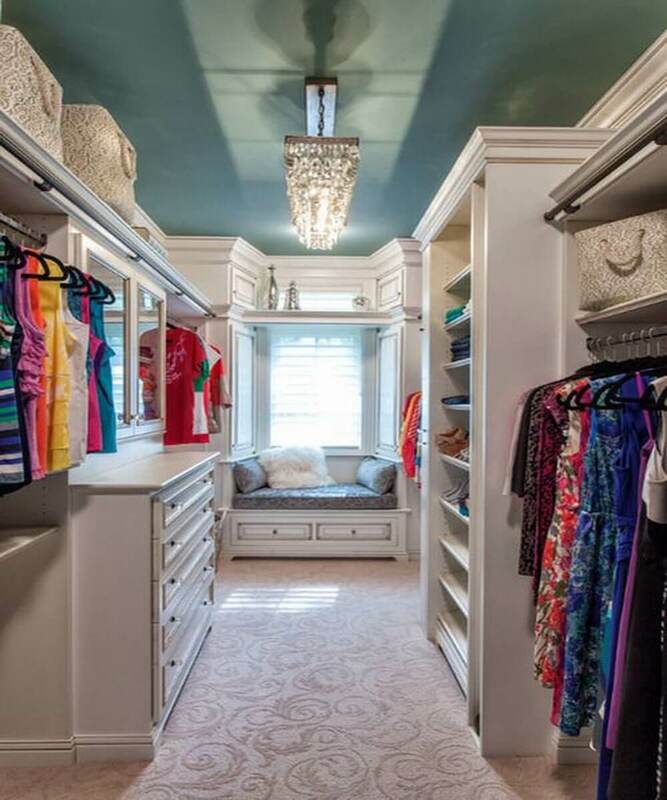 Every woman that has enough empty space in their room needs to allow themselves the ultimate pleasure of a large walk-in closet. After all, what could be more satisfying and amazing than walking into a glamorous closet full of clothes and deciding on what to wear? A walk-in closet should be stylish, chic and of course practical, since you need to fit in all your clothes, accessories and of course shoes. You also need mirrors, seating, fabulous lighting, the list goes on… There’s a lot of things that need to be taken care of when designing a walk-in closet. 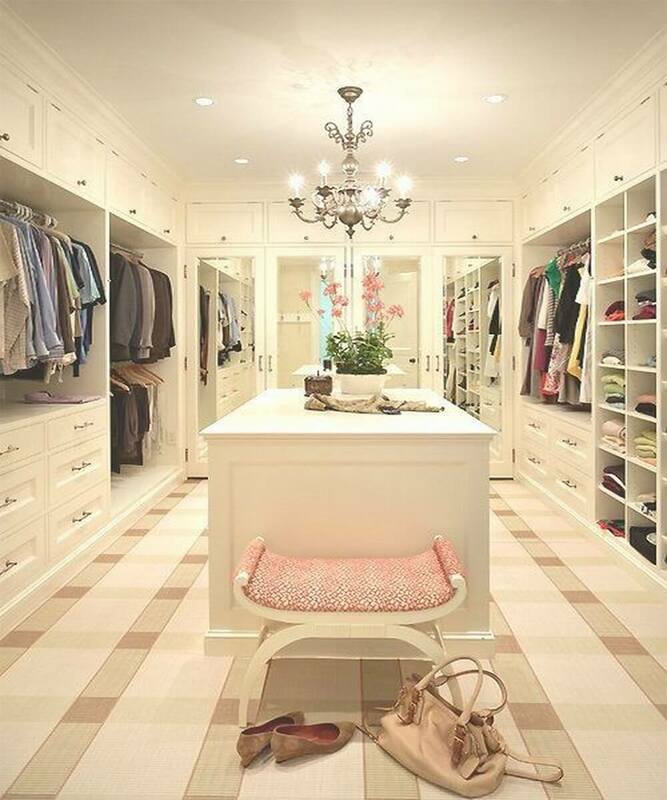 To help inspire you in this post we’ve collected several amazing examples of chic and sleek feminine walk-in closets. If these don’t get you motivated to get out there and start building your own walk-in paradise nothing will! These serene looking walk-in closet has a delicate beige color palette which displays a soft and feminine ambiance. The room is brightly illuminated with some amazing lighting, especially that chandelier and there’s tons of space to store all your items, including a fantastic island. This certainly looks like the perfect place for dressing up! 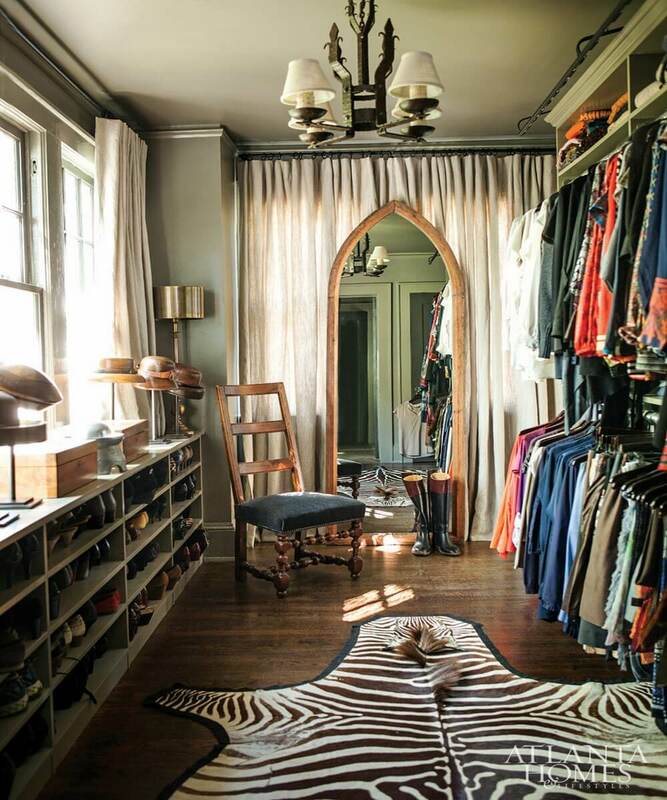 This wonderfully organized walk-in closet is so elegant, glamorous and sophisticated. What we love most here is the chandelier, the long chaise lounge chair and of course that puffy rug. These are the main charmers that add softness and appeal to this spot. This is a very lovely looking walk-in closet complemented with soft white furniture, a delicate textured rug and that beautiful pastel blue ceiling. This closet also features a wonderful chandelier and super inviting seating area under the bright window. 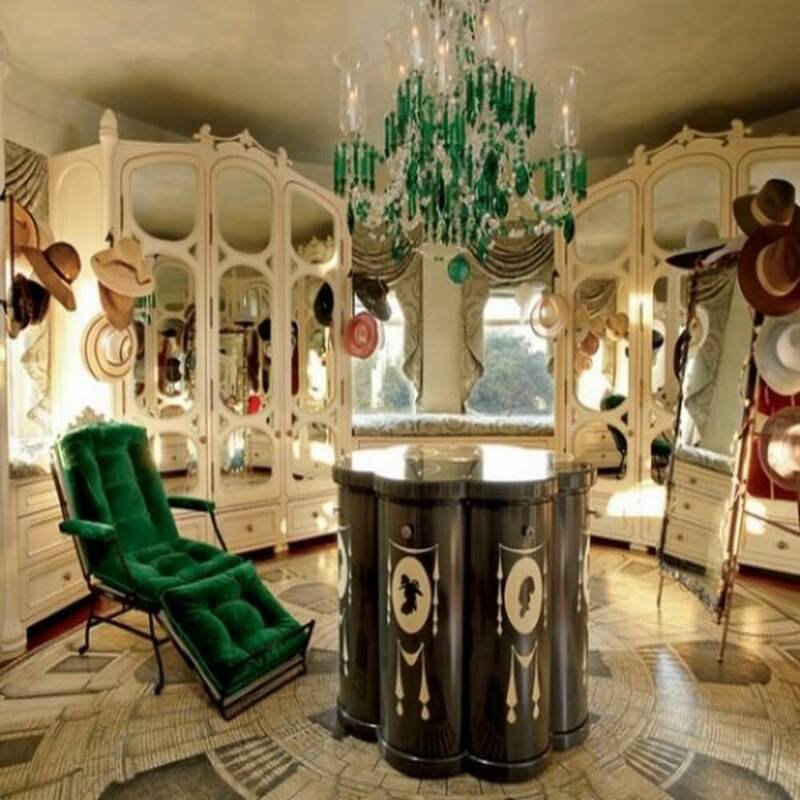 This walk-in dressing room screams vintage style and drama. We love the calm and elegant appeal of the space and how it’s punctuated but the wild and bold zebra skin rug. This can’t get any more fresh, lovely and chic with its pink color scheme and that gorgeous glass wall!! There’s a ton of dynamic energy in this round walk-in closet. It’s full of vibrancy and a playful spirit making it the absolute perfect spot to have fun dressing up. With all those mirrors you’ll have no problem seeing yourself from every angle. This spacious and super-organized closet looks both practical and welcoming. The simple white color plalette, bright lights and tons of clothes is more than enough for anyone to enjoy it. Wow! This dramatic and impressive closet radiates with elegance, style and grace. The deep color palette and the gorgeous accessories display a luxurious ambiance resulting in a dreamy place to get dressed. This playful closet shines with a perky and lively spirit. The white color scheme works perfectly with the super colorful clothes and shoes. You’ve got a great little make-up table and an ottoman to sit on. What more could you need? This walk-in closet is super warm and welcoming. The calm and natural color palette is instantly livened up by that charming zebra print ottoman. Everything is super bright and organized too which we love.